Chiang Mai (, from Thai: เชียงใหม่ [tɕʰiəŋ màj], Lanna: ᨩ᩠ᨿᨦᩉ᩠ᨾᩲ᩵ [t͡ɕīaŋ.màj]) sometimes written as "Chiengmai" or "Chiangmai", is the largest city in northern Thailand. 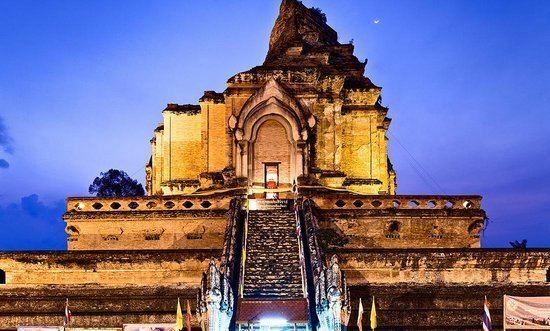 It is the capital of Chiang Mai Province and was a former capital of the Kingdom of Lan Na (1296–1768), which became the Kingdom of Chiang Mai, a tributary state of Siam from 1774 to 1899 and finally the seat of a merely ceremonial prince until 1939. It is 700 km (435 mi) north of Bangkok and is situated amongst the highest mountains in the country. The city sits astride the Ping River, a major tributary of the Chao Phraya River. Chiang Mai has positioned itself to become a Creative City and is considering applying for Creative City status with UNESCO. 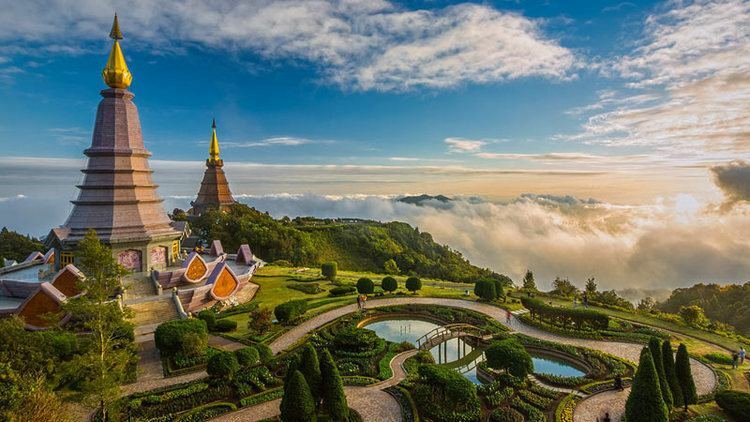 Chiang Mai was one of two tourist destinations in Thailand on TripAdvisor's 2014 list of "25 Best Destinations in the World", where it stands at number 24. 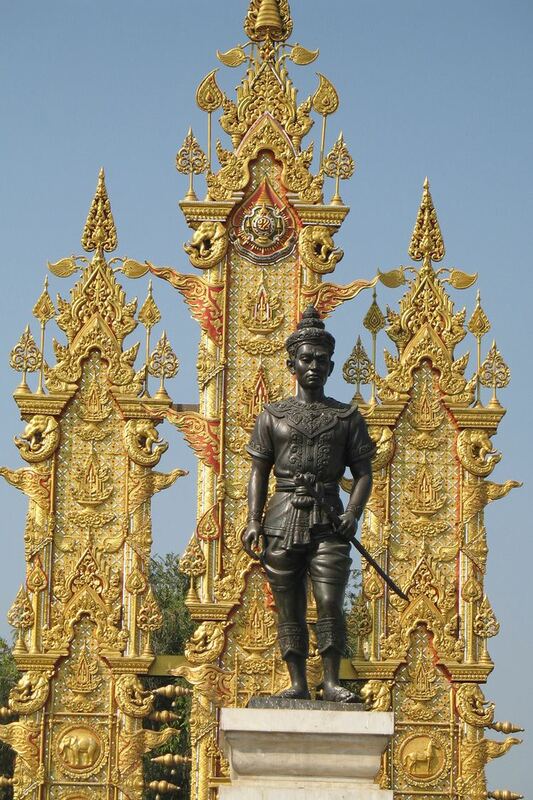 King Mengrai founded the city of Chiang Mai ("new city") in 1296 on the site of an older city of the Lawa people called Wiang Nopburi. Gordon Young, in his 1962 book The Hill tribes of Northern Thailand, mentions how a Wa chieftain in Burma told him that the Wa, a people who are closely related to the Lawa, once lived in the Chiang Mai valley in "sizeable cities". 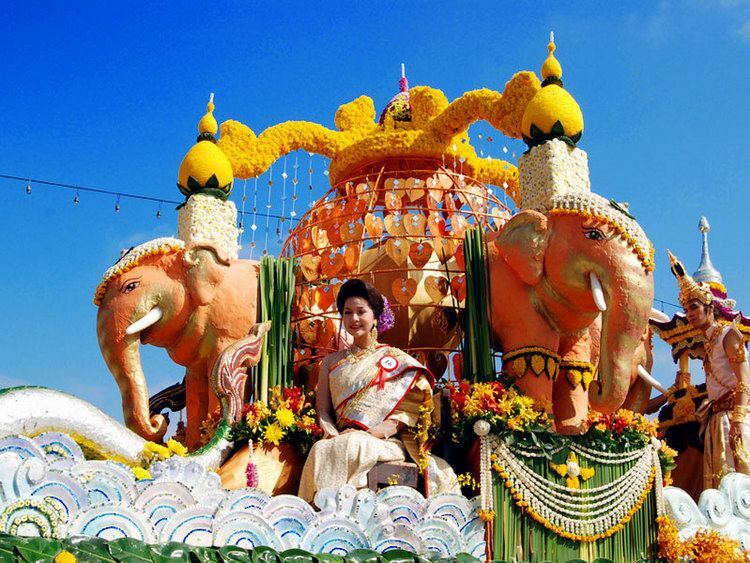 Chiang Mai succeeded Chiang Rai as the capital of the Lan Na kingdom. 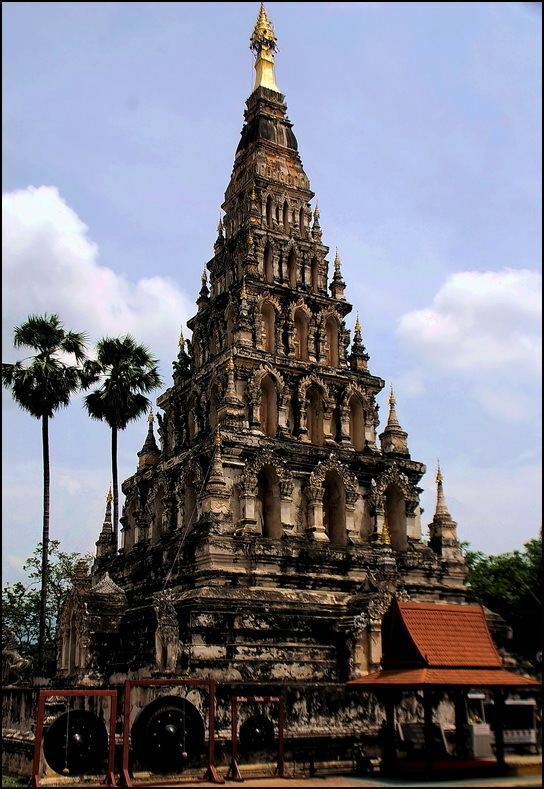 Pha Yu enlarged and fortified the city, and built Wat Phra Singh in honor of his father Kham Fu. The ruler was known as the "chao". The city was surrounded by a moat and a defensive wall since nearby Burma was a constant threat, as were the armies of the Mongol Empire, which only decades earlier had conquered most of Yunnan, China, and in 1292 overran the bordering Thai Lü kingdom of Chiang Hung. The city emblem shows the stupa at Wat Doi Suthep in its center. Below it are clouds representing the moderate climate in the mountains of Northern Thailand. There is a naga, the mythical snake said to be the source of the Ping River, and rice stalks, which refer to the fertility of the land. 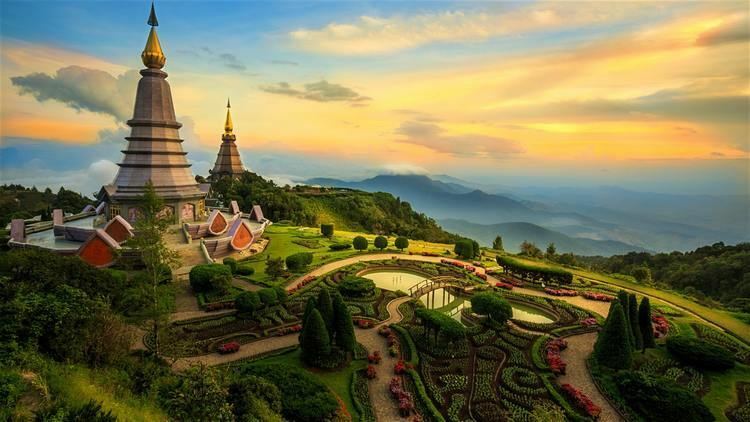 Chiang Mai has a tropical wet and dry climate (Köppen Aw), tempered by the low latitude and moderate elevation, with warm to hot weather year-round, though nighttime conditions during the dry season can be cool and much lower than daytime highs. The maximum temperature ever recorded was 42.4 °C (108.3 °F) in May 2005. According to the Bangkok Post, corporations in the agricultural sector, not farmers, are the biggest contributors to smoke pollution. The main source of the fires is forested area being cleared to make room for new crops. The new crops to be planted after the smoke clears are not rice and vegetables to feed locals. A single crop is responsible: corn. The haze problem began in 2007 and has been traced at the local level and at the macro-market level to the growth of the animal feed business. "The true source of the haze...sits in the boardrooms of corporations eager to expand production and profits. A chart of Thailand's growth in world corn markets can be overlaid on a chart of the number of fires. It is no longer acceptable to scapegoat hill tribes and slash-and-burn agriculture for the severe health and economic damage caused by this annual pollution." These data have been ignored by the government. The end is not in sight, as the number of fires has increased every year for a decade, and data shows more pollution in late-February 2016 than in late-February 2015. The northern centre of the Meteorological Department has reported that low-pressure areas from China trap forest fire smoke in the mountains along the Thai-Myanmar border. Research conducted between 2005 and 2009 showed that average PM10 rates in Chiang Mai during February and March were considerably above the country's safety level of 120 μg/m3, peaking at 383 μg/m3 on 14 March 2007. According to the World Health Organization (WHO), the acceptable level is 50 μg/m3. Wat Phrathat Doi Suthep, the city's most famous temple, stands on Doi Suthep, a hill to the north-west of the city. The temple dates from 1383. Wat Chiang Man, the oldest temple in Chiang Mai, dating from the 13th century. King Mengrai lived here during the construction of the city. This temple houses two important and venerated Buddha figures, the marble Phra Sila and the crystal Phra Satang Man. Wat Ku Tao in the city's Chang Phuak District dates from (at least) the 13th century and is distinguished by an unusual alms-bowl-shaped stupa thought to contain the ashes of King Nawratha Minsaw, Chiang Mai's first Burmese ruler. Wiang Kum Kam is at the site of an old city on the southern outskirts of Chiang Mai. King Mengrai lived there for ten years before the founding of Chiang Mai. The site includes many ruined temples. Wat RamPoeng (Tapotaram), near Wat U-Mong, is known for its meditation center (Northern Insight Meditation Center). The temple teaches the traditional vipassana technique and students stay from 10 days to more than a month as they try to meditate at least 10 hours a day. Wat RamPoeng houses the largest collection of Tipitaka, the complete Theravada canon, in several Northern dialects. Two gurdwaras (Sikh Temples), Siri Guru Singh Sabha and Namdhari, serve the city's Sikh community. Tam Bun Khan Dok, the Inthakin (City Pillar) Festival, starts on the day of the waning moon of the sixth lunar month and lasts 6–8 days. The inhabitants speak Kham Muang (also known as Northern Thai or Lanna). Historically, it is a dialect referred to as the Chiangsaen dialect (also a precursor Kingdom to Chiangmai and Chiangrai) still spoken in parts of northern Laos today, they speak this dialect among themselves, though Standard Thai is used in education and is understood by almost everyone. The script used to write this language, called Tua Mueang, is studied only by scholars, and the language is commonly written with the standard Thai alphabet. English is used in hotels and travel-related businesses. Khantoke dinner is a century-old Lanna Thai tradition in Chiang Mai. It is an elaborate dinner or lunch offered by a host to guests at various ceremonies or parties, such as weddings, housewarmings, celebrations, novice ordinations, or funerals. It can also be held in connection with celebrations for specific buildings in a Thai temple and during Buddhist festivals such as Khao Pansa, Og Pansa, Loi Krathong, and Thai New Year (Songkran). Chiang Mai has several universities, including Chiang Mai University, Chiangmai Rajabhat University, Rajamangala University of Technology Lanna, Payap University, Far Eastern University, and Maejo University, as well as numerous technical and teacher colleges. Chiang Mai University was the first government university established outside of Bangkok. Payap University was the first private institution in Thailand to be granted university status. Doi Pui- Doi Suthep National Park begins on the western edge of the city. 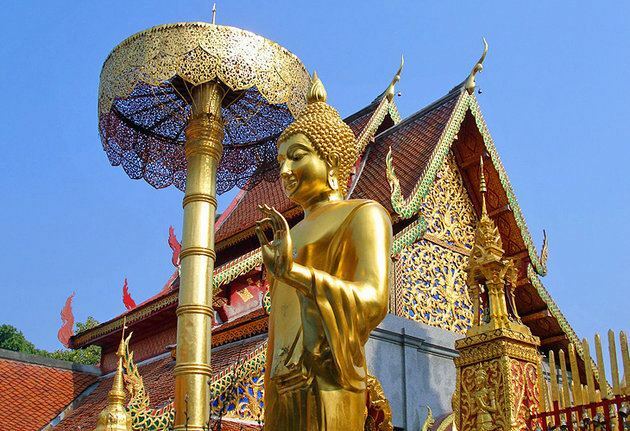 An important and famous tourist attraction, Wat Doi Suthep Buddhist temple located near the sumit of Doi Suthep, can be seen from much of the city and its environs. Doi Pha Daeng National Park, or more commonly Chiang Dao National Park which includes Doi Luang Chiang Dao and Pha Deang mountain near the border with Myanmar. The Chiang Mai Zoo, the oldest zoo in Northern Thailand, sprawls over an enormous tract of land. Thai massage: The back streets and main thoroughfares of Chiang Mai have an abundance and variety of massage parlours which offer anything from quick, simple, face and foot massages, to month-long courses in the art of Thai massage. Thai cookery: A number of Thai cooking schools have their home in Chiang Mai (see also Thai food). For IT shopping, Pantip Plaza just south of Night Bazaar, as well as Computer Plaza, Computer City, and Icon Square near the north-western corner moat, and IT City department store in Kad Suan Kaew Mall are available. A number of bus stations link the city to Central, Southeast, and Northern Thailand. The Central Chang Puak terminal (north of Chiang Puak Gate) provides local services within Chiang Mai Province. The Chiang Mai Arcade bus terminal north-east of the city (which can be reached with a songthaew or tuk-tuk ride) provides services to over 20 other destinations in Thailand including Bangkok, Pattaya, Hua Hin, and Phuket. There are several services a day from Chiang Mai Arcade terminal to Mo Chit Station in Bangkok (a 10- to 12-hour journey). The locally preferred form of transport is personal motorbike and, increasingly, private car. Local public transport is via tuk-tuk, songthaew, or rickshaws. Local songthaew fare is usually 20–50 baht per person for trips in and around the city. For groups, the fare per person is less. Tuk-tuk fare is usually at least 60–100 baht per trip (the vehicles are comfortable for two passengers, but some can squeeze in four passengers); fares increase with distance. Chiang Mai is estimated to have 32,000–40,000 hotel rooms and Chiang Mai International Airport (CNX) is Thailand's fourth largest airport, after Suvarnabhumi (BKK) and Don Mueang (DMK) in Bangkok, and Phuket (HKT). The influx of tourists has put a strain on the city's natural resources. Faced with rampant unplanned development, air and water pollution, waste management problems, and traffic congestion, the city has launched a non-motorised transport (NMT) system. The initiative, developed by a partnership of experts and with support from the Climate & Development Knowledge Network, aims to reduce greenhouse gas emissions and create employment opportunities for the urban poor. The climate compatible development strategy has gained support from policy-makers and citizens alike as a result of its many benefits.